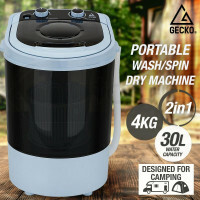 Perfect for small accommodations, recreational vehicles or caravans, Gecko's line of Camping Washing Machines is here to solve your laundry problems. With a washing capacity of 4kg for the single tub and 5kg for the twin tub, you can now lessen the clothes that you need to pack and even extend your outdoor trip for days. Whether you need a delicate or tough cleaning action, these machines will surely do the job as they have three washing programs and an adjustable water temperature setting to cater any types of fabrics. 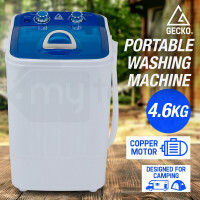 Designed to have a quiet washing and drying cycle, you can relax and enjoy the sceneries around you better than before. In just 15 minutes, fresher and cleaner clothes will be waiting for you. What's more? 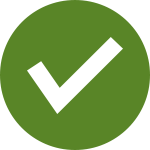 A special patent technology of cabinet integration is exclusive to these products, ensuring that your clothes will not come out of the washer all twisted and tangled. Visiting another location? You have nothing to worry. 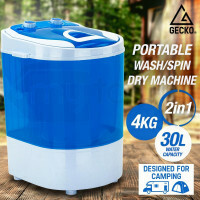 Gecko's Blue and White Camping Washing Machines have durable handles so they are easy to be brought from one place to another. Made from a high-quality plastic body casing and combined with the necessary Australian accreditation for white goods, these items are durable and could last for a long time. Enjoy an action packed and adventurous trip. Ranging from Trekking Poles to Solar Panels, Mytopia's outdoor gears will surely cater your needs. Make your camping trip more comfortable than before. 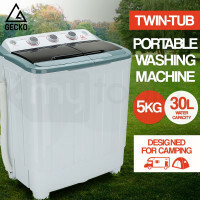 Use your Camping Washing Machine along with our Gazebos, Portable Showers and other camping products. Bid goodbye to all your laundry troubles! Ensure that you will have an epic and memorable camping experience with your loved ones. 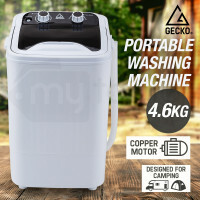 Purchase any of the Blue or White Gecko Portable Washing Machines now and get your soiled camp clothes cleaned and dried in an instant.